Today the first all-inclusive Oregon Higher Education Sustainability Conference came to a close at Portland State University. I was incredibly excited to be invited to be part of the conference and help lead a visioning portion of the Student Summit with Amanda Maxwell, our Oregon Co-Director, on behalf of the Cascade Climate Network. The efforts resulted in a beautiful vision document that we hope will be used to further sustainability across the Northwest and which aligns with our CCN Declafesto. Please read the text of the document below or access the PDF version here OHESC Student Summit Vision. Update: Student governments across the state are starting to endorse and pass resolutions in support of the OHESC Student Summit Vision. ASSOU endorsed the vision a week after the conference and ASUO Senate unanimously voted to pass the vision in resolution form on Wednesday (2/20). The establishment of structures to ensure the longevity of such practices. From this date until OHESC 2019, we will partner with and expect our institution’s leadership to take action on the following tangible steps towards a true culture of sustainability. Mandate programs that provide a holistic introduction to sustainability for first year students, new staff, faculty and administrators, which address oppression of both people and the planet. 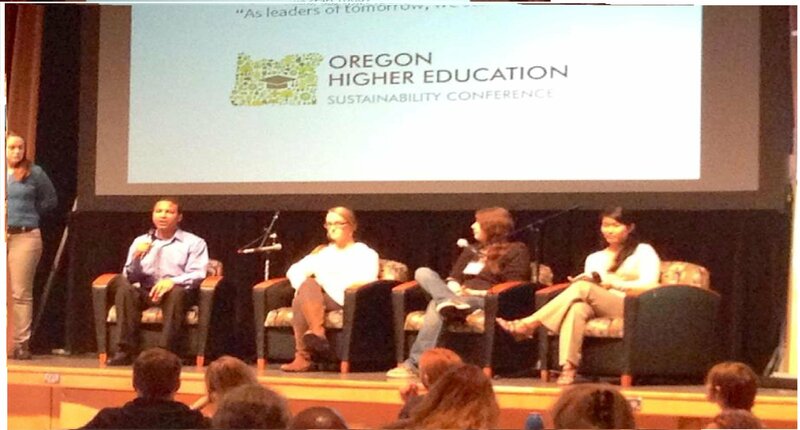 Through this vision and the previous steps, the Oregon higher education students, will work with our campuses to build off of the work done at the 2013 Oregon Higher Education Sustainability Conference and bring innovative changes to our communities. Way to go! This is great, and I hope it leads to many ideas and projects!